Funded by the EU, the InSCOPE project provides an open-access pilot line service that promotes innovation in printed electronics. 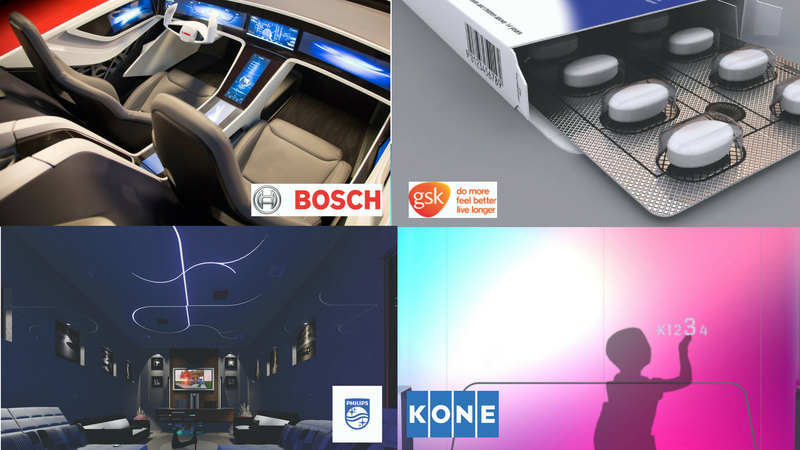 For the pilot line’s first showcase, the InSCOPE team successfully integrated sensing, lighting and haptic (touch) feedback functionalities to create an interactive media surface panel for the Kone Corporation. Consisting of a smart LED media grid, the showcase panel is implemented in an elevator car where it performs multiple functions including people guidance, decoration, and advertising. The InSCOPE consortium comprises leading research and technological development (RTD) centers in Europe that bring new product concepts to life. Four large European enterprises are involved to showcase and validate the pilot line for applications in the automotive, smart building and medical packaging markets. The five companies are: TNO (Netherlands), CEA (France), CPI (UK), IMEC (Belgium), and VTT (Finland). The following image shows four showcases in the InSCOPE project related to automotive (top left), medical packaging (top right) and smart buildings (bottom left and right). By working closely together, these institutes are tailoring hybrid printed electronics equipment and functionalities towards industrial needs. Initial results of the cooperation have brought improvements to printing, assembly and post processing equipment. Additionally, development of printed functionalities (e.g. printed temperature sensors) and assembled functionalities (bare die assembly) have been optimized to fit industrial showcases. The open access pilot line service has been operational since January 2018 and has already processed 15 demo cases. InSCOPE’s ambition is to become the leading hybrid TOLAE pilot line service worldwide. In today’s dynamic world, media architecture is one of the most current and recognized fields in urban planning and building design. The Kone Corporation foresees these large area media surfaces being an integral part of future urban space and living. Therefore, developing intelligent wall materials, rather than displays, enables digital solutions to be part of the spatial experience by forming dynamic interior designs. A first demonstrator prototype of the interactive media surface was shown in PRINSE2018 and at Lopec 2018. The surface was created using roll-to-roll manufacturing of 200 mm x 2400 mm, flexible and transparent display engines. The engines have individual controllable RGB LEDs capable of displaying video content and producing dynamic lighting effects. Scrolling information updates are performed using a Chrome browser application and Bluetooth connection. Long distance capacitive proximity sensors enable UI activation, while short distance capacitive proximity sensors support passenger selection. The media panel can identify people in the elevator with up to one-meter distance, and can recognize different users (adult, child, disabled). Finally, as part of the UI panel, the haptic feedback element provides user selection feedback. Haptic feedback technology is revolutionizing human-machine interfaces (HMIs), with touch-enabled interfaces already well on the way to replacing traditional pushbutton controls in a broad range of markets. “We were looking for large scale production using printed electronics solutions, and the InSCOPE project has given us the opportunity to study, share visions and needs based on these technologies,” said Jukka Korpihete, senior lighting design specialist at Kone. The Kone Corporation will implement a total of 18 square meters of interactive media surfaces to an elevator car as a final demonstrator of the product. To learn more about production guidelines for printed electronics, InSCOPE created the public design handbook of the pilot line (available from the project website at http://inscope-project.eu/handbook/). The EU-funded InSCOPE project will continue to target improvements of advanced printed functions and advanced silicon devices that enable thin, lightweight, bendable, and even stretchable products. “This project has received funding from the European Union’s Horizon 2020 research and innovation programme under grant agreement No 731671”.